Bourbon Street is one of the most famous nightlife strips in the world. This New Orleans thoroughfare has been delighting visitors to the city since its earliest days and continues to be a bucket list item for travelers around the world. Like heavily-touristed areas everywhere, Bourbon tends to be crowded and more than a little bit cheesy, but it's also vibrant and entertaining, and every visitor to the city should see it at least once. Bourbon Street runs parallel to the Mississippi River for the entire stretch of the French Quarter, from Canal Street to Esplanade Ave. The majority of nightlife is on the upriver stretch of Bourbon (the end closer to Canal Street). Downriver of St. Philip Street, is primarily residential. The lower stretch of commercial Bourbon, from St. Ann down to St. Philip, is home to primarily gay bars (all are welcome at bars on both ends of the strip, but if you're single and looking to meet someone, this is pertinent information). 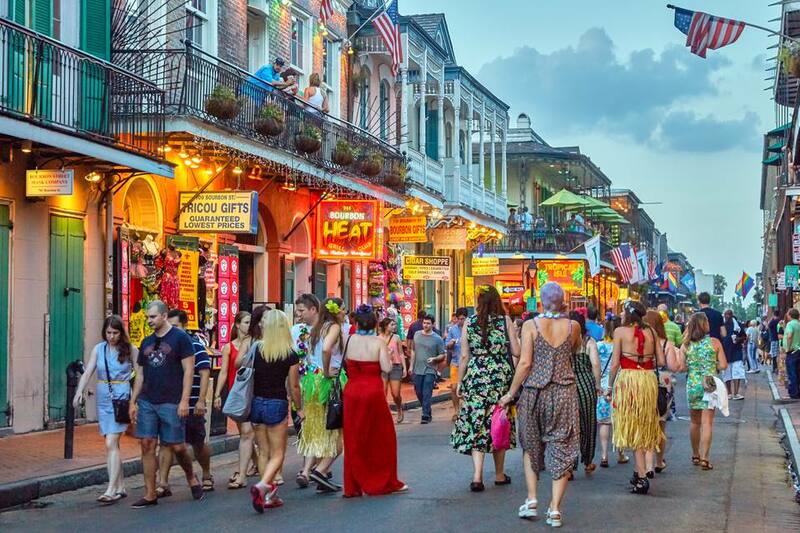 Most tourists tend to spend the majority of time between Orleans and Bienville Streets, where basically every storefront is a bar or souvenir shop and the pedestrianized street is filled with revelers and street performers. In New Orleans, you're legally allowed to consume alcohol on the street, and on Bourbon, it's standard practice. A large number of bars on the strip aren't even bars, they're just cubbyholes from which vendors sling drinks of all kinds in plastic cups called "go-cups." You can get a go-cup anywhere in the French Quarter (even fancy restaurants tend to have them on hand). Some are collectible shapes (Tropical Isle's famous Hand Grenades come in cups shaped like, well, hand grenades), and these tend to be more expensive. Daiquiris tend to come in more standard styrofoam or plastic cups, so if you're looking for a souvenir, make sure you check first to see how your beverage is being served. New Orleans is a fabulous city for kids, from toddlers to teenagers, but Bourbon Street is adults-only. The strip clubs with their tawdry advertisements, the women flashing their breasts for beads thrown from balconies, and the general atmosphere of drinking and debauchery makes it a no-go zone, particularly at night (it's tamer during the daytime, but also not particularly interesting for kids). That said, if you have delicate or childlike sensibilities, Bourbon Street also might not be for you. New Orleans has plenty of wholesome activities to offer (honestly!) -- no need to feel uncomfortable if it's not your thing. Where there are drunk tourists, there are pickpockets and scammers. This is true the world around and Bourbon Street is no exception. It's not a hotbed of violent crime, but petty thievery is sadly quite common. Follow basic rules of safety: carry purses in front of you and put wallets in your front pocket, don't bring unnecessary valuables, never hang your purse on a chair or leave it unattended, etc. While you're at it, be prepared for some common street scams with these tips for staying safe on your NOLA trip. Don't Feel Bad For Having Fun or Not Having Fun! The vast majority of contemporary guidebooks (and contemptuous locals) will sneeringly tell you that Bourbon Street isn't the real New Orleans. This is kind of silly. Yes, it's a district that caters to visitors, but unlike corporatized entertainment districts elsewhere, it's 90% locally-owned and has a deep history that is hardly separate from that of the rest of the city (you can read up more on this in one of local geographer Richard Campanella's book, Bourbon Street: A History, or one of his shorter articles on the subject). Spending time and money on Bourbon Street is, unquestionably, positively contributing to the city's economy. That said, it's also okay to not like Bourbon. It's loud, tawdry, and Bacchanalian, and fans of craft beer or authentic traditional jazz or fine arts might find themselves preferring some of the city's other interesting entertainment corridors -- here are some ideas. Basically, don't let guidebooks or folks with their own agendas tell you how to feel about it. You're not alone either way!